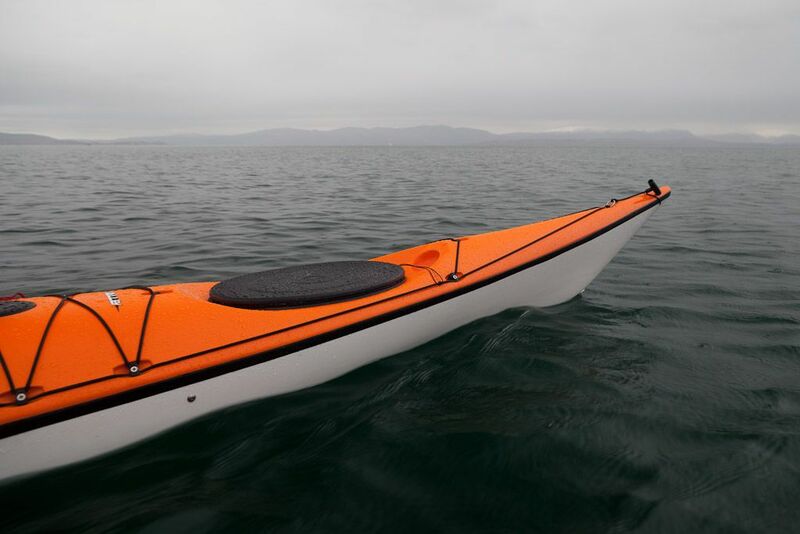 The Etain is a full sized expedition kayak. It is designed to attract customers who for various reasons do not like Valley's classic expedition kayaks, the Nordkapp and the Aquanaut. Those that decide they don't like the Nordkapp generally do so after 2 minutes because they don't like its apparent lack of primary stability when sitting in calm water (if only they would persist because the Nordkapp is wonderful in rough, confused water). Anyway, a primary design brief was to have rock solid primary stability and Valley have done this by moving the wide point slightly aft of the cockpit but more subtly so than in the P&H Cetus, with which this kayak will be competing. Now I had better make a declaration of interest. 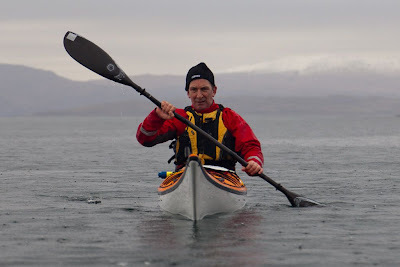 I think I am reasonably impartial when commenting about my experience of different kayaks. 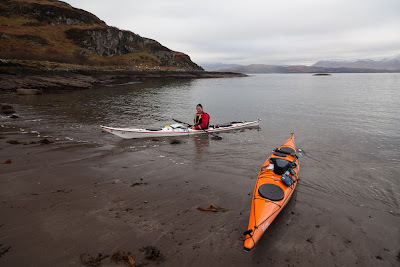 I currently own three sea kayaks, a P&H Quest LV, a Valley Nordkapp LV and Rockpool Alaw Bach, so clearly I am not slavishly attached to any particular manufacturer. 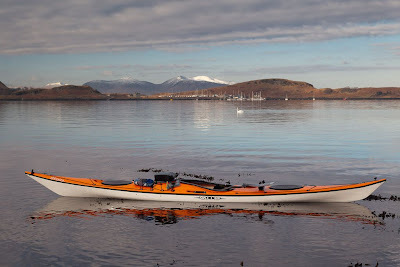 I have also been lucky enough to have had long term test boats lent to me by various manufacturers/retailers including P&H, Valley, Rockpool, Seakayaking UK, Point 65 and others. In 2009 and 2010 I had a P&H Cetus on long term test. 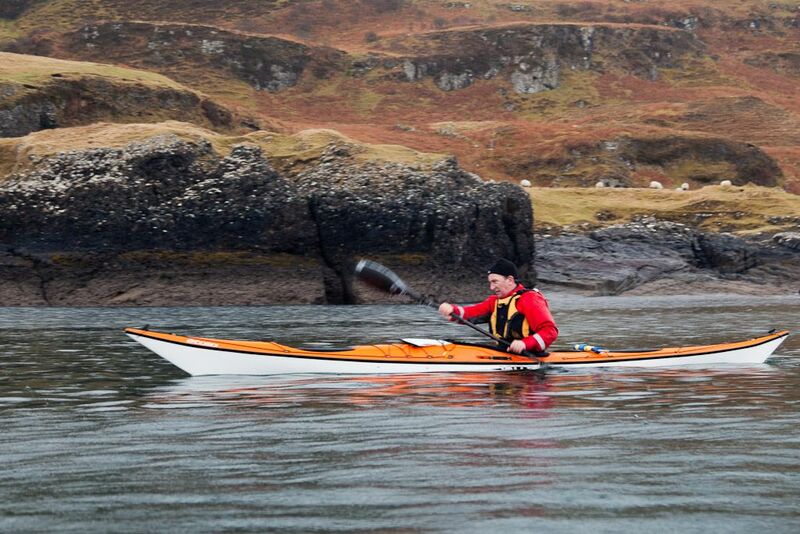 It is no secret that I thought it was a superb sea kayak. For the purpose of this test, I brought along my own Nordkapp LV, a traditional Valley design to compare with the Etain, which in Valley's words is "a new strain of DNA in the Valley range, one that is a little more contemporary both in style and paddling feel." I have a bad knee but even so, I found getting in and out of the Etain's huge cockpit very easy. The plastic seat with padded cover is fitted low in the cockpit which aids stability but the rear deck is not too high to inhibit lay backs. 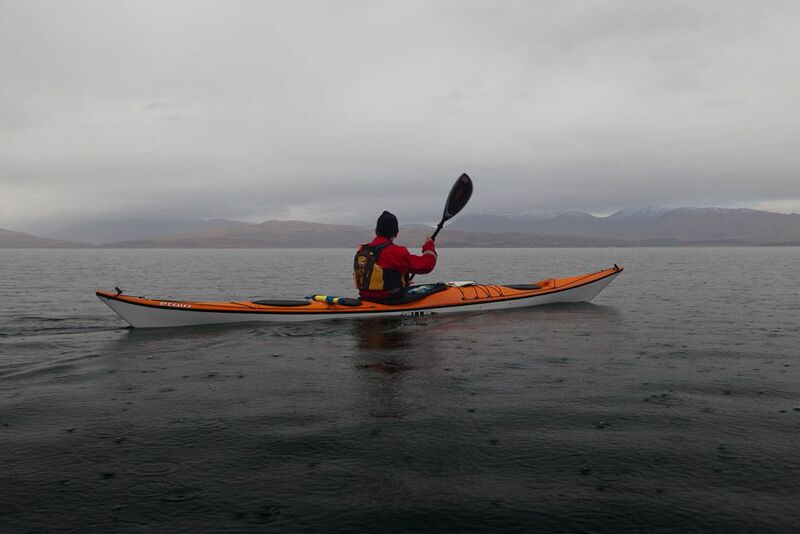 On the water, at rest, this is a very stable kayak. It has a bit more V than the Cetus and so it tips from side to side by a few degrees but then becomes very stable. Taking a photograph, with an expensive DSLR in the Etain, is sooo much more reassuring than in my Nordkapp LV! 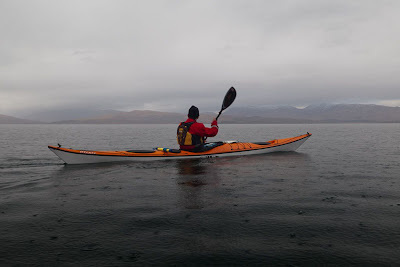 You can edge this kayak right over and you rest on a comforting wall of solid, secondary stability which is quite unlike the Nordkapp LV (which we were paddling along with it). On edge the Etain is very manoeuvrable but it did not feel so quick to turn as the Cetus. It felt about the same as the Rockpool GT, which is still a manoeuvrable expedition kayak. On edge the Etain did not turn so quickly as the Nordkapp LV but the Nordkapp required a great deal of concentration to balance on edge to turn quicker than the Etain! We had light force 0 to 2 winds so I cannot comment on how it handles in a wind but it tracked very straight. This was a preproduction model (and lacked some finishing details as it had been rushed out for testing) but the standard of the GRP layup was outstanding and blemish free. In this photo you can just see some very soft chines washing out towards the bow and stern. 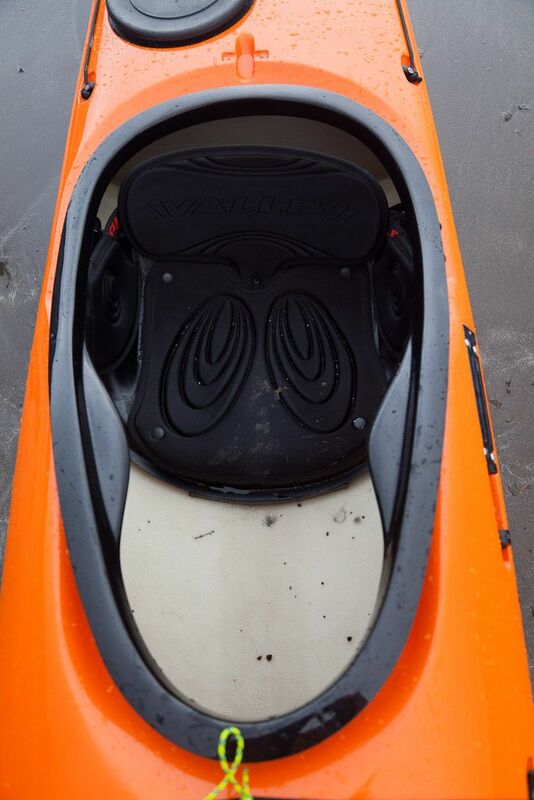 It is a very big kayak and carries more volume up front than the Cetus but less than a Rockpool GT. It is less rockered than the Nordkapp LV. 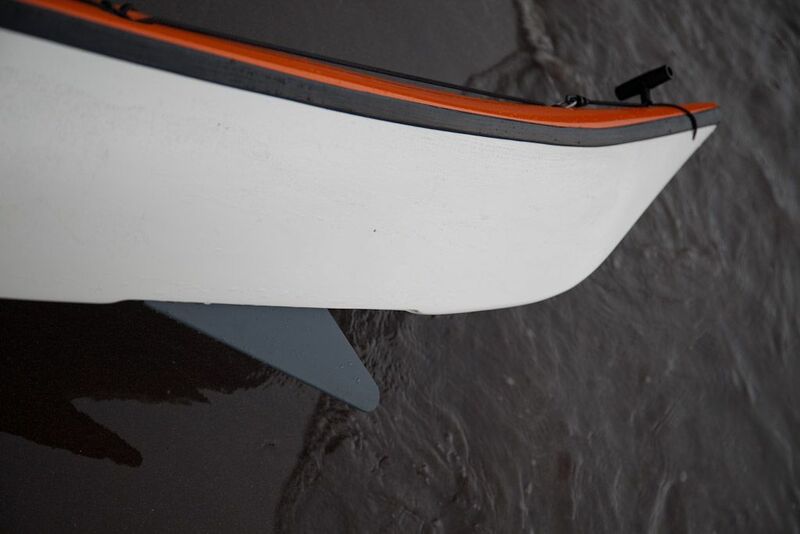 The profile of the stern has a moderate built in skeg, a little less prominent than those of the Cetus and GT. 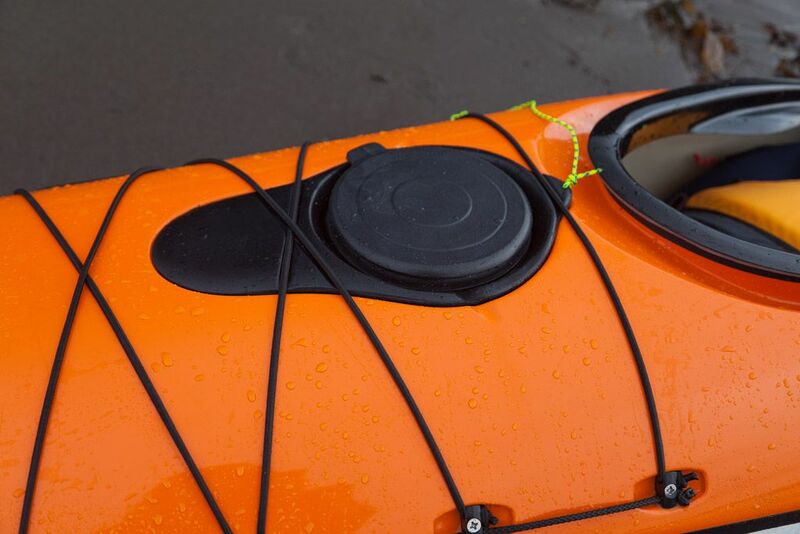 A unique feature is the removable deck pod, secured by deck elastics (and on production versions by a line with a mini carabiner). There is not a lot of room inside the pod, certainly not enough for a VHF, but it will take a wallet, keys, biscuit bar and a phone. 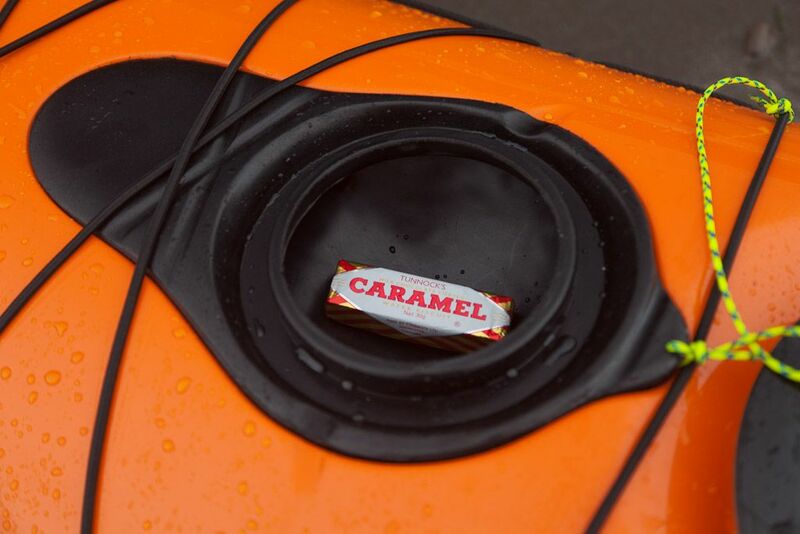 The pod and its valuables can be quickly removed, if you want to leave your kayak on a busy town beach while you go shopping. As a result of the pod's modest size, you can see that there is not a huge intrusion into the cockpit space. This means there is plenty of room for the feet, unlike the Cetus, where your feet are restricted to remaining either side of its bigger pod. For a moment we wondered why a carrying strap had not been fitted to the pod. Then again, I might be prepared to walk round George Street in Oban in my dry suit but I draw the line at carrying an item that looks like something the ward sister might bring to the bed bound in the middle of the night! I would be quite happy to slip it into a plastic carrier bag. The cockpit is incredibly easy to get in and out of. The thigh grips did not connect with my thighs at all and I have bulky thighs! I thought they were too far back and would need padding with some foam. Both the Cetus and Rockpool GT have better thigh grips. My knees ended up in a recess under the deck, outboard of the cockpit. With a little padding my knees would have been really comfortable. The foot pegs are the same as fitted to other Vally kayaks: aluminium tracks with small plastic pedals. They do not have adjustable wands but can be adjusted while sitting by hooking the toes of the opposite foot behind the pedal and pulling back on the locking lever then sliding the foot peg either way while it is squeezed between both feet. 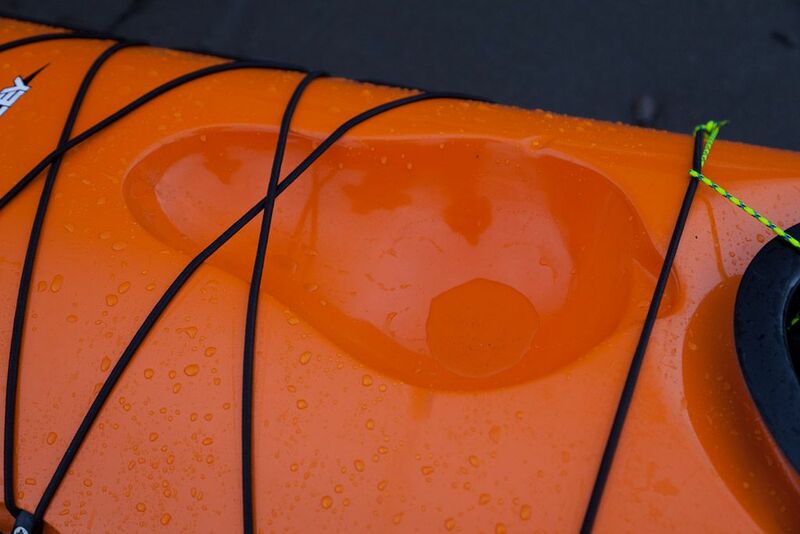 The base of the seat back is secured to the seat by a mid line button but both Stuart Wagstaff, owner of Sea Kayak Oban, and I removed it as it did not really work for us. The seating position, in a relaxed paddling position has plenty room for the feet and was really comfortable all day. I found it less comfortable with knees raised in the braced position and would pad it out with closed cell foam. Note the moulding, behind the cockpit, that will be fitted with a security bar/tow mount on production version. The left mounted skeg slider mechanism worked faultlessly. We did not have enough wind to really test the skeg but it is the same as that fitted to other Valley composite kayaks. ...but it is not so obviously Swede form as the P&H Cetus. Valley's website has a graph that shows that the Etain's median, ideal load is only 20 lbs more than the Nordkapp LV's. That equates to about 10l of volume and I just don't believe that for a second. 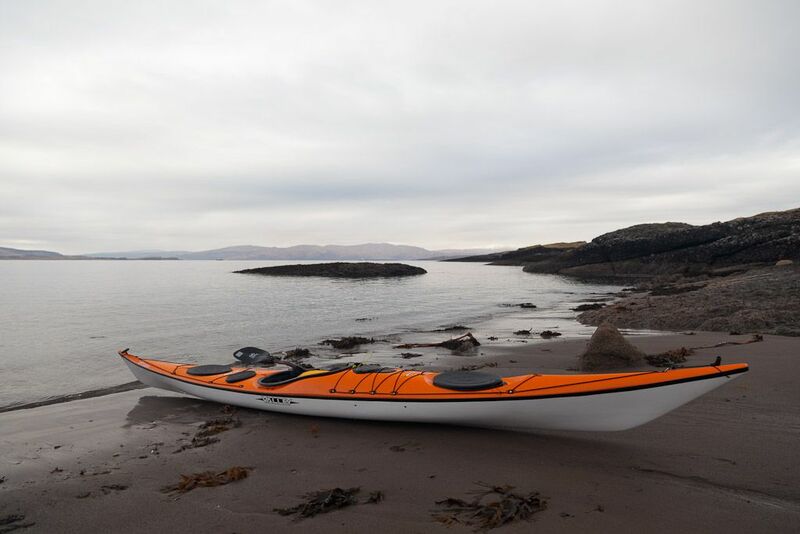 Side by side on the beach, the Etain is much larger, compared with the Nordkapp LV and on the water the Nordkapp LV feels tiny in comparison. Paddling the two, back to back, Phil and I agreed that for people weighing about 75 to 90kg, these two would make ideal partners as day kayak and expedition kayak. 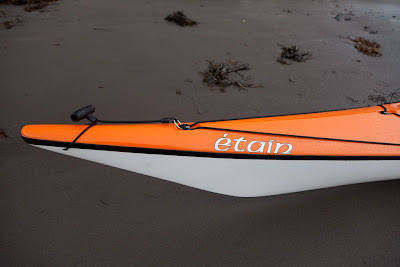 Talking of weight, the Etain did not seem heavy for a standard, Diolen layup, kayak of this size. 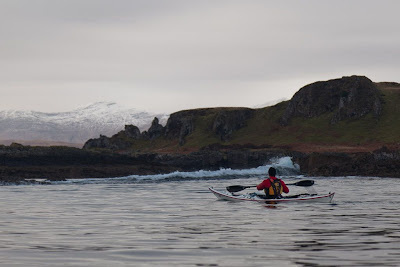 Unfortunately there were no wind generated waves but there was a little swell and we had timed our arrival at the SW tip of Kerrera for maximum tidal flow of 5km/hr on the spring tide. 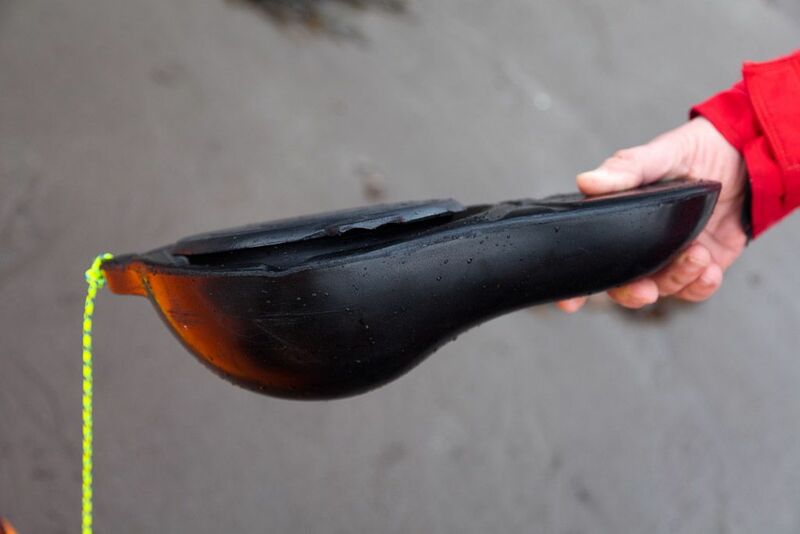 First of all, the Etain behaved impeccably in the moderate tidal flow. Secondly it caught each swell easily and then ran straight without broaching. In this respect it was much easier to control than either the Cetus or the Rockpool GT, which both need more paddler input and edge control to prevent broaching. 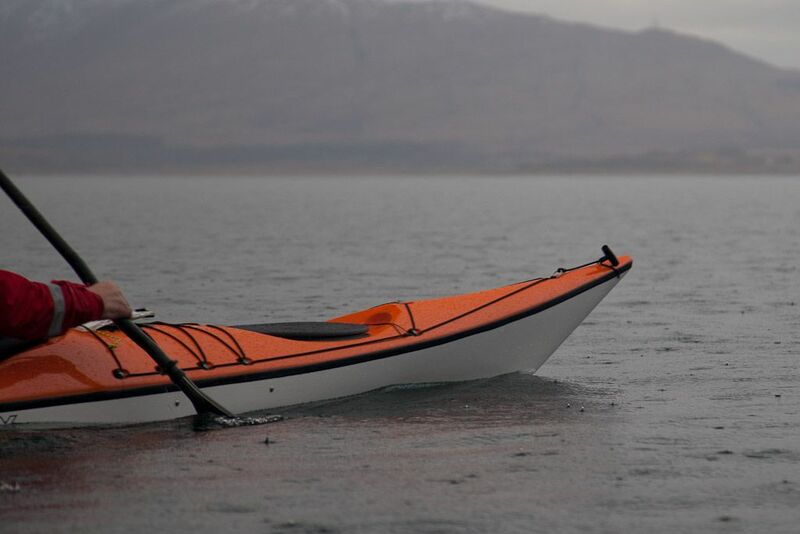 I have always liked the feeling of Valley expedition kayaks such as the Aquanaut on a wave and the Etain seems to maintain this despite the move from fish form to Swede form. It is a nice looking kayak on the water. There is a great deal of volume up front and the oval front hatch should make packing easy. Note the high peak to the foredeck forward of the hatch. Plenty of free board, when unloaded, promises great carrying capacity on expedition. 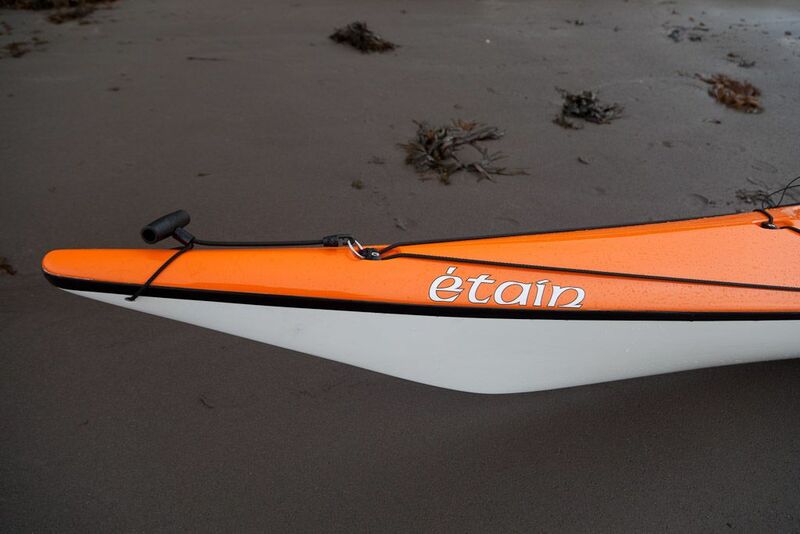 The Etain feels effortless to paddle over a long distance at 6-8km/hr. 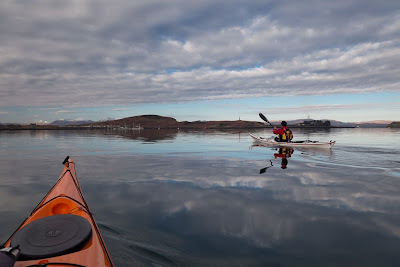 I was very happy paddling at 6.8km/hr in calm flat water. Phil paddled a bit more quickly than that. My overall average moving speed was 5.8km/hr but that included frequent stops for photography. 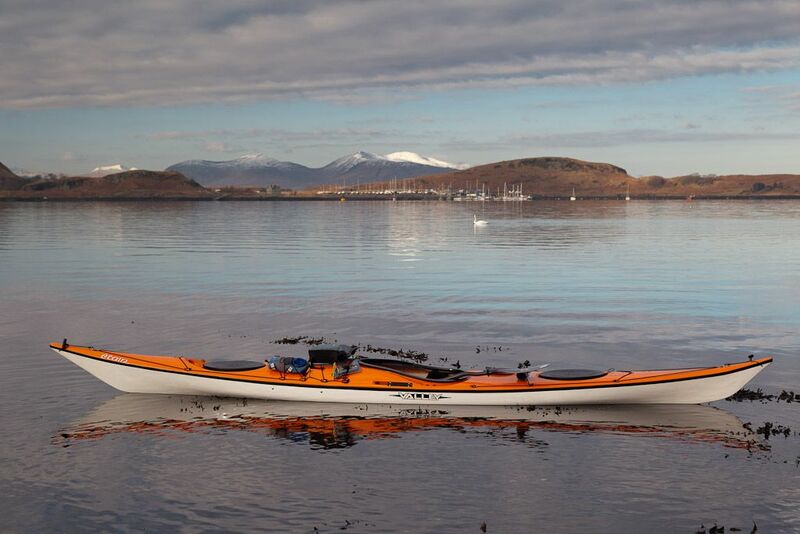 On flat water, the Etain's unloaded maximum sprint speed was 5% less than that of the unloaded Nordkapp LV (which is known to have a particularly low drag for a touring kayak). End toggles, deck lines, elastics, and recessed deck fittings are all standard Valley quality items. The CalMac ferry LOTI was running late and held her speed until close to Kerrera. We manoeuvred to catch her 2' wake. Again the Etain displayed excellent surf manners and she ran straight and true on LOTI's wake. All too soon, our 25km trip came to an end and we were back in Oban. Phil has been paddling for 2 years. 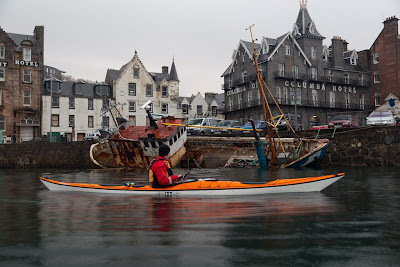 His own kayak is a Quest, his verdict was that if he had the money, he would by the Etain. Paddling it unloaded, back to back, with the Nordkapp LV, I preferred the Nordkapp LV as a day kayak (but this is a kayak I have paddled in this role for 5 years). The Etain is designed primarily as an expedition kayak and I usually only use the Nordkapp LV for overnight camps, due to its size and my weight. The difference is that the Etain can be used as a day boat and I think that many newcomers to the Valley brand will use it primarily in that role. 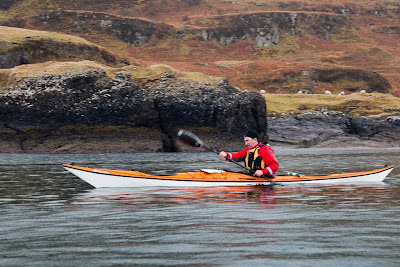 On this day paddle, The Etain's character steadily grew on me and I was sorry to hand it back. Obviously a full review of its characteristics would need a camping trip with wind, tide and surf conditions. My first impression is that this is fantastic addition to the Valley stable. 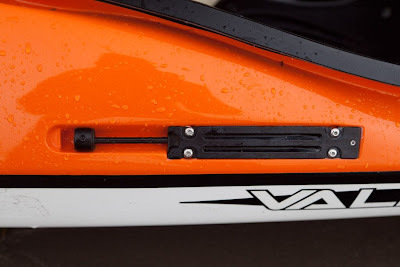 It achieves Valley's aim of introducing a new style of kayak to the range, one with increased primary stability but it is still very much a Valley in other respects. It is kayak that will attract and look after many more beginners and intermediates than the Nordkapp. I was reminded of this when I got back in the Nordkapp LV and tried to take a photo, suddenly it felt rather unstable! Although these broad figures look similar, I have seldom paddles two kayaks with such different feel. The Nordkapp LV tapers in breadth, height and volume much more quickly towards the ends. 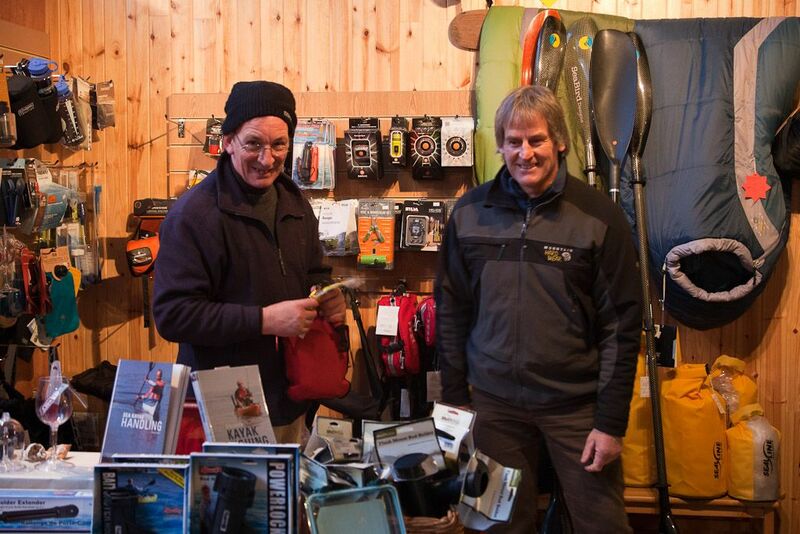 Many thanks to Stuart Wagstaff (right) of Sea Kayak Oban for arranging the demo.